This set of five “how to do” and “benefits of” Pilates PLR Articles pack is exclusive to Strategic Entrepreneur Services and can only be bought from here on my How to do it resources site. 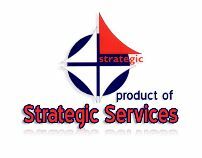 They are great quality and your site readers will love them. 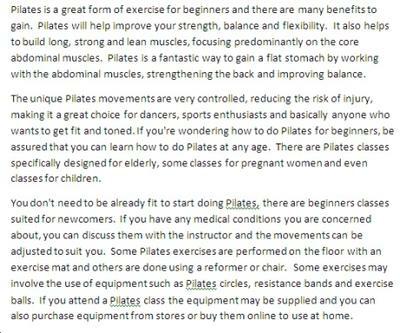 These How to do Pilates articles are very informative on the subject of Pilates and the benefits of learning how to do Pilates and contain a very substantial 500+ words in each article. 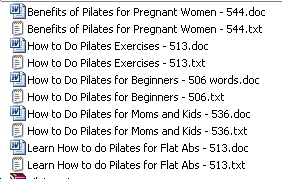 This PLR articles pack has five unique articles written exclusively for us that comes to you in both .txt and .doc formats – just click on the graphics above for the full list of the how to do Pilates article Titles. If you want to read a sample from this pack, you can view a section of one of the articles in the images above. Just click on the pictures to view them full size. 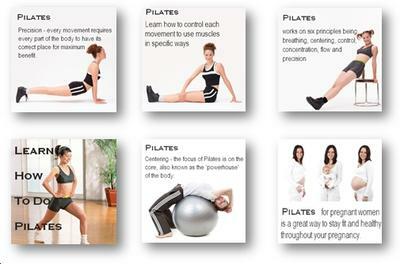 Also included in this PLR articles pack is a bonus pack of six royalty free Pilates graphics especially created for this pack – Click on the graphics above to see a composite of the graphics included for free. They are reduced and pre-sized for you to make it easy to upload them to your blog, or to use them on your web2 properties like Squidoo, who require 250x250 size for their Introduction graphics on new lens pages. Being small images makes your web pages load much faster for your readers. The graphics also feature descriptive text about Pilates as well , and that makes them very attractive for your readers to pin to their PinInterest boards, so these are perfect for your marketing efforts for places that share graphics. And you also get a list of the top 100+ Pilates Keywords that have the least search engine results page (SERP) competition. And you get all this for a bargain price of only $4.50!